Hi There!!! 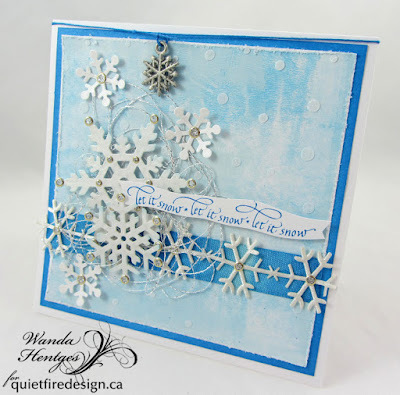 I have a very wintry, snowy card for you today and that's exactly what it's like here in Iowa, at least in parts of Iowa. A week ago we had a blizzard that dropped over a foot of snow. The wind was just a howling out. But 40 minutes north of us they didn't get any snow. LOL, it amazes me how that happens. 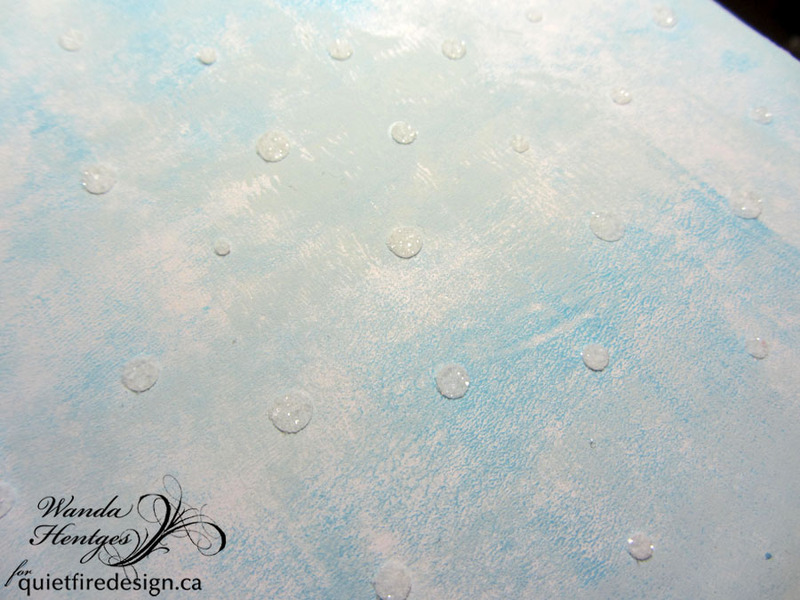 I started my background by brayering paint onto white card. The idea is not to cover the paper. Put just a bit of paint on your craft sheet, roll the brayer through it a few times and then lightly roll it over your paper. 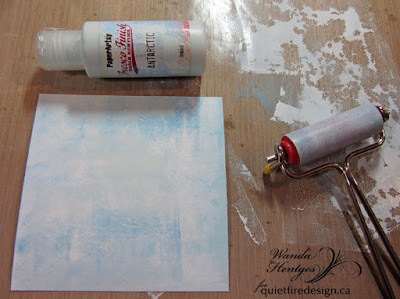 Pick up a bit more paint and brayer it onto the paper in a different area. You can go in just one direction or multiple directions. 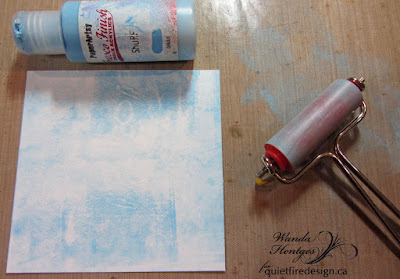 I've used a mini brayer but a regular brayer works just as well. Repeat with another color of paint. I got a little too much on my craft sheet so I just spread it out more with the brayer to be sure there wasn't too much going on the paper. I used colors that gave a wintry feel to the background but this works for all kinds of colors and all kinds of moods. 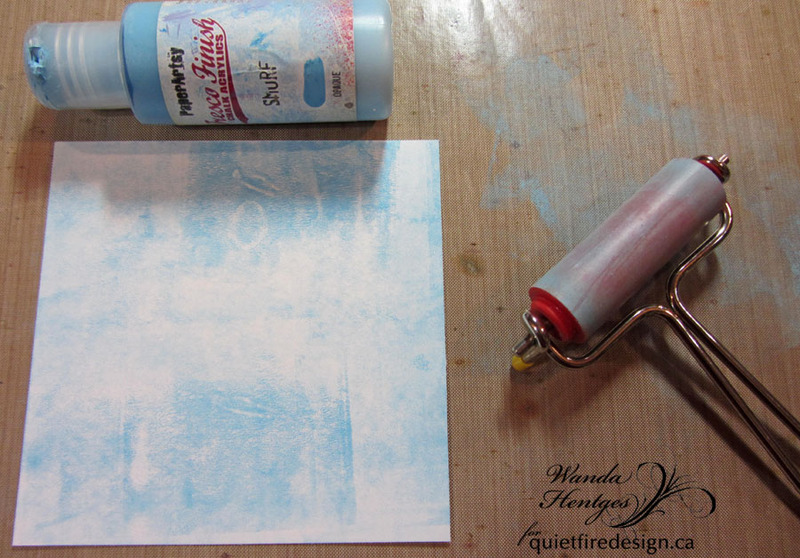 Did you know that Suzanne has some digital cutting files on her site for making stencils? You can find them HERE. Using the Silhouette Cameo I die cut the Snowfall design from a transparency. 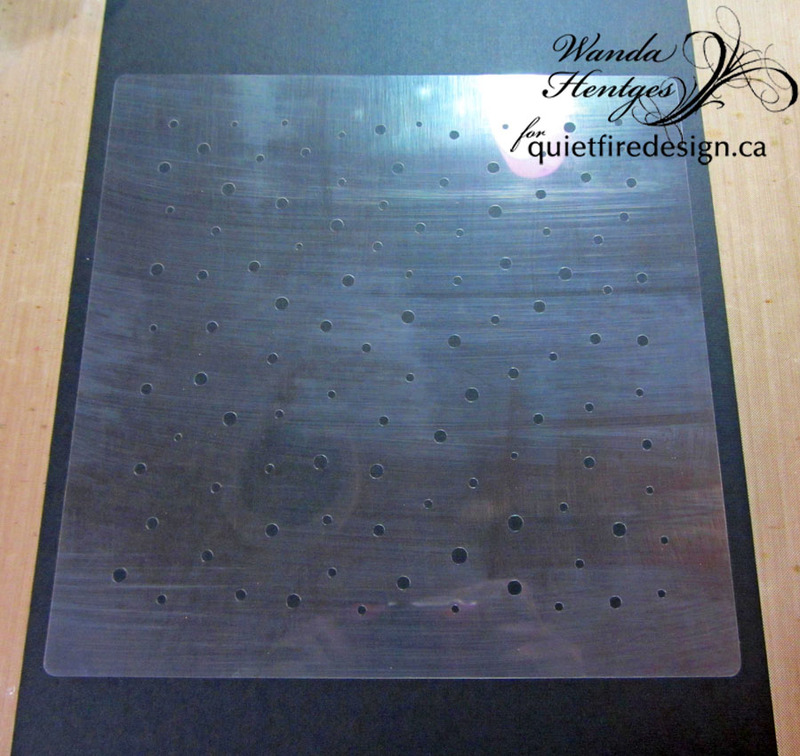 I need to get some stencil material and try it but a transparency can work great too. Before cutting the transparency, I sanded it a little with a sanding block only so it wouldn't be completely clear and I'd be less likely to lose it in my work area :-) I took this picture with it sitting on a piece of black cardstock so you could see the pattern better. I chose to make this the exact size that loads when you bring it into the software. That worked very well but I'm thinking other sizes would be nice too and will do that in the future. It's always fun to have a stencil pattern in more than one size. I put Texture Paste Opaque Matte (Ranger) through the stencil, removed the stencil, added Distress Dry Glitter to the paste and let it dry. 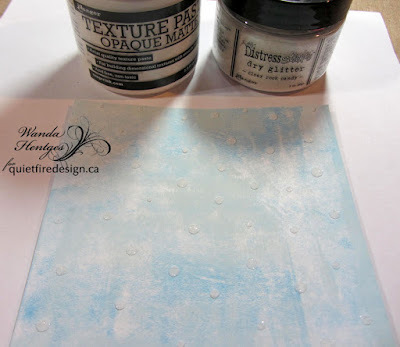 Be sure to clean the paste off your stencil before it dries. 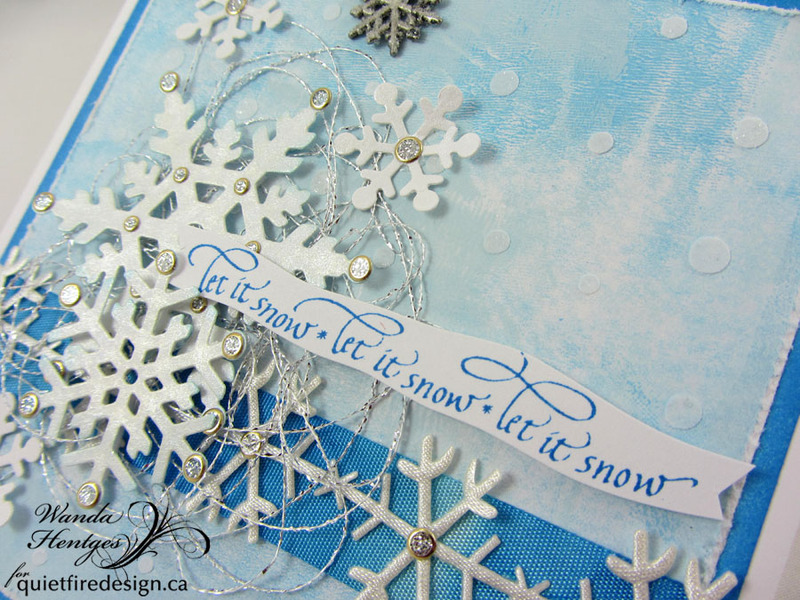 Let it Snow, Let it Snow, Let it Snow is stamped onto white cardstock with Archival Ink Manganese Blue (Ranger) and cut out as shown. The ribbon is Crinkle Ribbon from the Tim Holtz Trimmings pack (this trimmings pack is retired and when they're gone, they're gone) and it's colored with Distress Spray Stain (Tumbled Glass, Salty Ocean). Over the colored Crinkle Ribbon is some snowflake ribbon. I die cut some snowflakes. 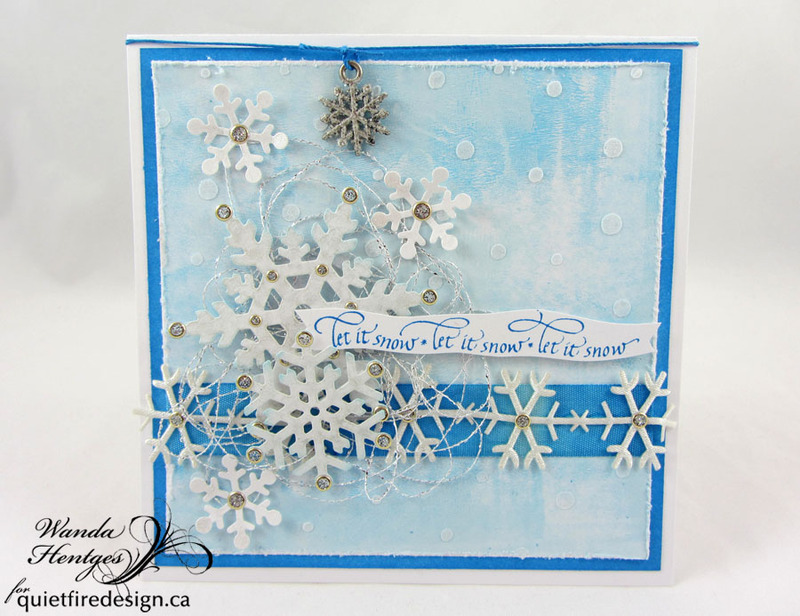 The 2 larger snowflakes are from #757 Snowflakes (Elizabeth Craft Designs). The 3 smaller snowflakes are the extra snowflake in the Brrrr and Snowflake Set. 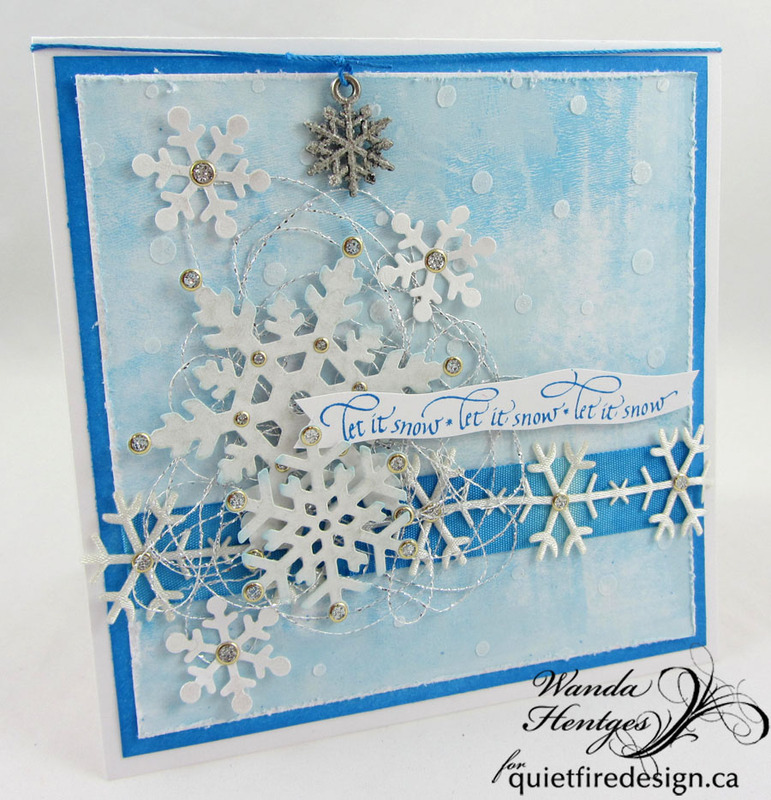 All the snowflakes are die cut from white cardstock. The larger two are sprayed with Mica Spray (Lapiz and Pearl). The smaller three have only Pearl Mica Spray on them. 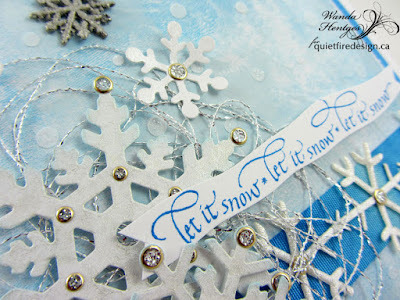 I added Glitter Dots Peel Off Stickers (Elizabeth Craft Designs) to all the snowflakes, even the Snowflakes Ribbon. Some snowflakes are attached with foam tape and others directly onto the card. There is some fine silver fiber from my stash added under all the snowflakes. 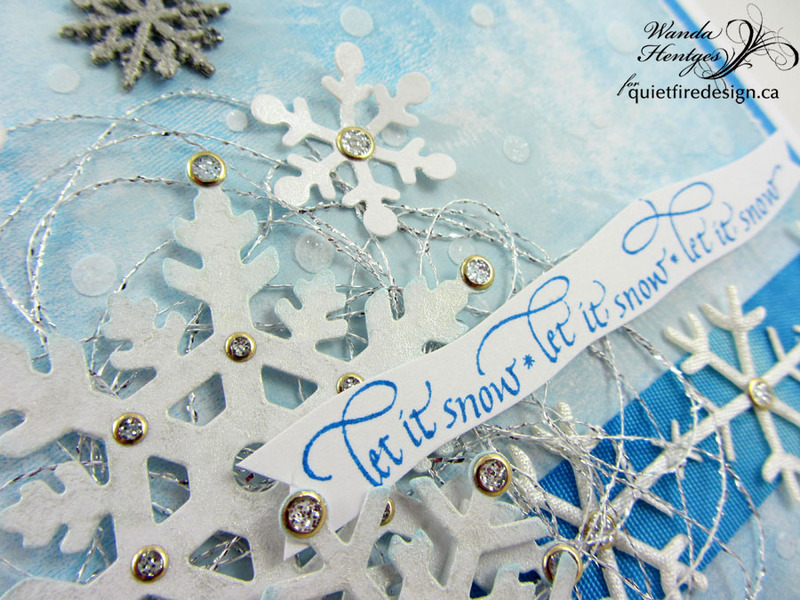 I've wrapped the top of the card with blue Tim Holtz Craft Thread and hung an Idea-ology Snowflake that was brushed with Distress Collage Medium Matte and sprinkled with Distress Dry Glitter. I hope you like today's card. I really enjoyed making it and am quite pleased with how it turned out. thanks for the step outs! 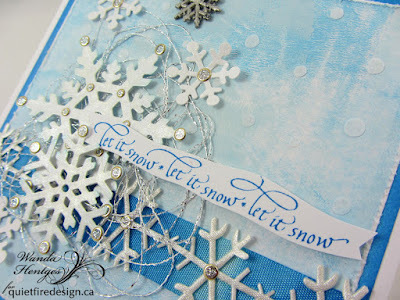 love the falling snow "stencil" and all the glittery snowflakes! This is a Flurry, so wintery. Take it from me, in the land that holds the copyright to winter, aka Norway. You have nailed this, from the colors to the florish of snow! 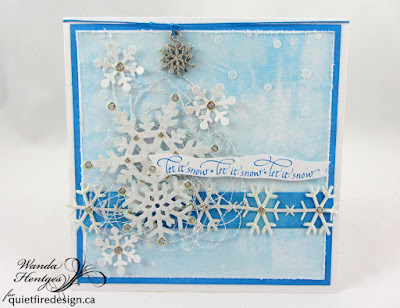 Great card & tutorial! Thanks for sharing both.